« Banquet time! Last call!! Dennis Nilsson didn’t make headlines with his final licencing run. No wonder, as the Swede had to do it on a cloudy and rainy Sunday, one week after the European Finals and without the die-hard drag race fans in the Santa Pod grandstands. But one attempt was enough and with 4.32 seconds at 272.11 mph Nilsson had his Top Fuel licence in his pocket. 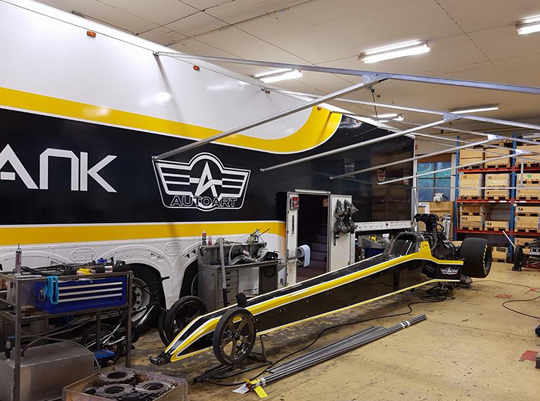 As the car is waiting in the workshop, the planning for a 2018 FIA European Top Fuel Championship campaign can really take off. Dennis Nilsson only had to do one run to earn his Top Fuel licence, but still it was a close call that weekend at Santa Pod Raceway. “For sure it was”, said the 29-year old Nilsson, who lives in Helsingborg, Sweden. “I needed one good run. 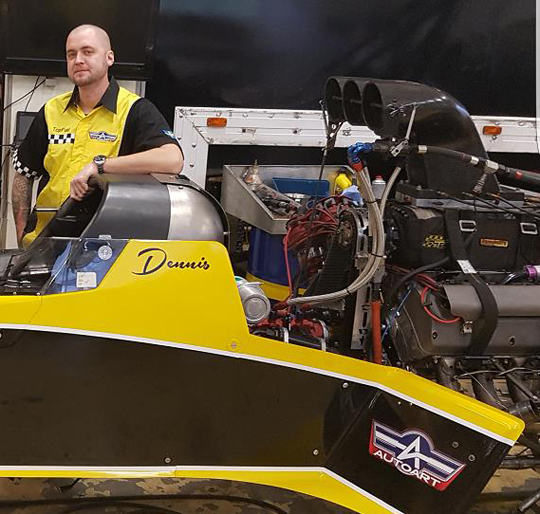 We made up a plan with Rune Fjeld to drive one of his Top Fuel dragster the week after the European Finals at Santa Pod. We got there on Friday, and it rained. We sat in the pits all Saturday with heavy rain, and so no driving was possible. Sunday morning it rained again, and we had to catch our plane at 3 PM. But the sky was clearing up and as it looked like we could run at 1 or 2 PM, we rescheduled our flight to Monday lunchtime. I was the first car out that Sunday with thousands of Fords waiting, as it was the FordFest event that Sunday. The car hooked up to the track and I made a 4.32-second pass at 272.11 mph! The licence was there! What a great day and well worth waiting!”, said Nilsson about this exciting weekend. Let’s hope Nilsson’s plans come together and the rookie Top Fuel driver can do the full FIA European Championship tour next year.